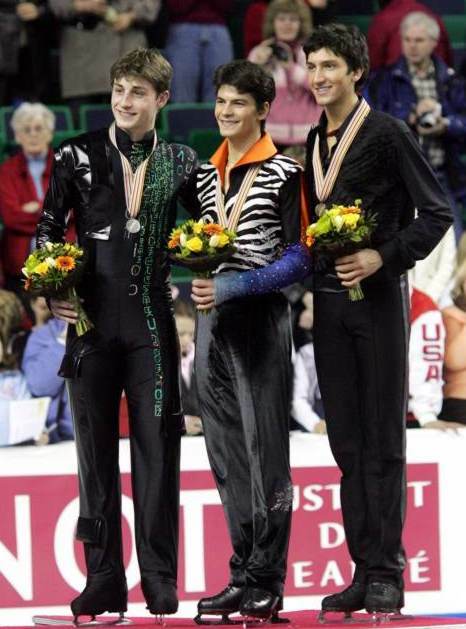 Brian Joubert won the Short Program after placing third in his qualifying group, and not sits third overall in the Men's event. It was a good skate and a personal best for Joubert. "I felt good from the very beginning," said Joubert. "The quad didn't take off well, but I saved the jumps. I wasn't perfect on the quad, but I did the triple (for the combination). That's great. The score is great, 80 points is what I wanted. When competing, I'm always going for a medal. The most important thing is to feel good in the program. I felt very good after the qualifying with my quad-triple and my triple Axel, and I told myself that bodes well for the Short Program, but the others have been skating well, and there was a lot of stress." Though Joubert was not completely pleased with his quad triple, the judges were less harsh and the element received GoEs of 0, with a couple of +1s. Emanuel Sandhu redeemed himself somewhat in the Short Program with a second place finish, but after the disaster that was the qualifying free skate he remains seven points out of the top three in fifth place overall. He is at best a long shot for the bronze if he skates well in the final Free Skating. He would be much better positioned for a medal, however, if he had not two-footed and then fallen on triple Lutz. Third in the Short Program, and currently second overall is Nobunari Oda, trailing the leader by 3.16 points. His program was very well skated, and was a personal best. Even wthout a quad-triple in the Short Program he remains in the running for medal, and perhaps event the gold. After his performance he said, "Being in the last warm up group with the top level skaters gave me a different kind of pressure. So again, I was so nervous. But I was quite satisfied to be first after the qualifying round. For the Short Program, I was just thinking about doing three jumps cleanly and enjoying myself afterwards. Actually, after landing the triple Axel, I felt more comfortable and also the crowd support helped me. I had fun tonight." Stepane Lambiel was fourth in the Short Program, but he holds the top position overall after obtaining huge scores in the qualifying round. Lambiel had a rough start in the program, receiving negative GoEs for his opening triple Axel, which had a near fall, and a squat landing on quad toe loop which was followed with only a double toe loop. After those two elements, however, he pulled it together to finish strong. He commented, "Yesterday I had a very good program and the time to recover before today was very short, as we had the draw last night at 11 PM. It breaks the rhythm, all these little things. I relaxes though, I was able to come here today, very concentrated. I did my job. I'm very satisfied. ... Concentrated and, I know that behind me they're pushing hard. I have to fight, to keep the first place. Johhny Weir currently sits in sixth place overall after a fourth place finish in the qualifying and a fifth place finish in the Short Program. His current point total gives him only an outside chance for a medal. It was a fairly good skate, but a sloppy triple flip received negative GoEs as did a wobbly final combination spin. Weir has been having back problems and said, "My back is being in spasm all week, so I've been having troubles with practices, with everything, with walking once I got out of bed in the morning. But I fought today, and that's what I'm proud of, not so much this performance which was decent, aside from the last step sequence and the spin. But just that I got through today was good for me." Sounding less than motivated, he added, "It's fine (lower levels he received for his spins), it's the last competition of hte season, and I really don't care about my levels. I don't care about anything. Just being here was a big enough step for me. I didn't want to come." Jeffrey Buttle placed seventh in this event segment, but had enough points from the qualifying that, even though he is currently in fourth place overall he retains a chance to move up one place for the bronze. He made two significant errors, with a poor landing on triple Axel with a turn out, and a fall on triple Lutz. "I have no idea, he said, on why he fell on the triple Lutz. "I guess I lost focus. I thought I was going to be fine. The turn out of the Axel was a mistake. I wasn't too concerned about it. So I didn't think it would affect the rest of the program, but again, I think I just wasn't concentrating enough on the Lutz." After a good skate and a second place finish in the qualifying, Eval Lysacek placed eighth in the Short Program and now lies seventh overall. Lysacek missed the jump combination, with a poor landing on the Lutz, and steps between the Lust and toe loop which he doubled, getting mostly -3s for GoEs on that element. Overall the program was a little sloppy and wild looking, and a little bit over the top on presentation. With a total of 105.25 points he is currently 9.11 points behind the top three, which makes him a very long shot for a medal for a medal here. After his performance he said, "I fell OK. I actually felt pretty good once I got on the ice. I jsut kind of had a slip there in the combination and tried to save it as best I could. I'm disappointed how it (the program) went." Finally, we mention Alban Prebaubert, who placed fifth in his qualifying group and 17th in the Short Program. He has no chance to medal here, but this newcomer is a colorful and engaging skater, and of the new faces here, he is the one most worth keeping an eye on for the future. Stephane Lambiel of Switzerland successfully defended his World title from last year with a program packed with difficult elements. Skating last to The Fours Seasons by Vivaldi, Stephane completed two quad toe loops, the first one in combination with an effortless triple toe loop. He opened his program with a triple Axel that was downgraded to a double Axel and given -0.06 for GOE. The only other error in his program came when the heel of the skate on his free leg caught on the ice as he was exiting a triple loop. He was given full credit for the triple loop but received -1.86 for GOE. Stephane sailed through the rest of his program that included another double Axel, a triple flip/triple toe loop combination, a triple Lutz/double toe loop combination, and a triple Salchow. Known for his great spinning capability Stephane was rewarded with 0.71 and 1.00 GOE for his two change foot combination spins. His score for this performance was 156.58 (78.70 TES + 77.88 PCS). Stephane expressed his excitement over his win at the press conference following the event. "I�m very happy and very proud. Because it was a hard competition. I did not know the scores (of the other skaters). I just wanted to do my job." Stephane was diagnosed with a knee injury before the Olympics. After the Olympics the injury flared up again and his doctor told him he had to take some time off of the ice. Stepane did not make a final decision to compete in Calgary until 10 days before the Championships started. Stephane was asked how this second title compared to his first. Stephane commented, "The first was a nice surprise. Today was harder because every skater wanted to beat me because I was first (after the short). I�m very proud to win this title." When asked if he planned to continue skating Stephane responded, "Yes, of course, I�m only 20 years old!" Brian Joubert, representing France, pulled himself up from third place after the short to win the silver medal with a score in his free skate only 0.11 points below Lambiel�s (156.47 � 79.99 TES + 76.48 PCS). Like Lambiel, Joubert completed two quad toe loops, one in combination with a triple toe loop. Joubert also completed a triple flip/double toe loop, triple Axel, triple loop, triple flip, triple Lutz, and triple Salchow. Skating to the Matrix, his program was strong and confident. His technical mark was 1.29 points above Lambiel�s, however, Lambiel�s strong component marks in areas of transition/linking footwork and choreography/competition kept him on top. Joubert started the season skating a program with more complex choreography. However, he struggled throughout the season and after placing 6th at the Olympics decided to go back to a program he trusted and felt comfortable with, The Matrix. Joubert explained, " For me this season was very difficult because my program was too difficult for me. I tried. I loved the music. It was just too hard. When I came back to Matrix it was magic for me." Joubert is a very talented skater, hopefully, next season he will be able find a program that pushes him choreographically while still allowing him to maintain his strong technical content. Joubert was asked how he felt about winning a second World silver medal. He said, "I think it is good. I can be World Champion. I know I can. For now I care just about my performance. I am happy for Stephane." On competing with Lambiel in the future he said, "It will be a good fight." Evan Lysacek made an amazing jump from 7th after the short program to win the bronze medal, a repeat of his placement last year. Evan successfully landed a quad toe loop in combination with a triple toe loop. The landing on his quad was two footed and he stepped out of the triple toe loop. However he received credit for both jumps with a -2.57 on the GOE. Landing the quad toe in competition was a great accomplishment. Attempting it was a gutsy move after the hard fall he took in the qualifying round, where he got credit for the rotation but received a -3.0 GOE and an additional one point deduction for the fall. Evan also landed seven triple jumps, including a triple flip/triple toe combination and completed a double Axel. His passionate performance to Carmen had the crowd clapping to the music during his straight line footwork, after which he ended strongly with a combination spin. He received 149.97 points for his skate (76.97 TES + 73.00 PCS). Evan said it had been a long, really difficult season. "I have been through a lot of illness and injury. It is a relief to put this successfull year to an end." Evan said he has been so stressed about quads and points that he has had to remember to settle down and trust his training. Evan stated, "Tonight I owe to Frank (Carroll, his coach) because he was able to rein me in and tell me kind of, �chill man�". Although Johnny Weir had a very difficult skate he was able to stay in the top ten with a 7th place finish (dropping from 6th after the short). He did complete his first quad jump rotation in competition. He also completed 6 triples, including a gorgeous opening triple Axel, triple toe loop. He took a hard fall on his triple flip at the end of the program and was slow to get up and back in to the performance. Persistent back problems have negatively impacted his performance at these championships. "I had back spasms all week and the fall in the warm-up (on the quad toe) aggravated it," Weir said. "And I kept trying, because I wanted to do the quad so badly." Matt Savoie, 10th after the short program, ended up in 11th overall. He struggled through the free skate. With some doubled jumps, a fall on his triple Axel, and step out of another jump, Matt was just not able to put together a consistent program. This is Matt�s highest finish at a World Championships and a big improvement over his 16th place finish in 2004, his last World�s appearance. "The season was a great one for me," Savoie said. "I definitely got the chance to compete a lot more than I anticipated. I had some good performances at some key times � probably the best of my career. Even though tonight wasn�t the best I�ve ever done, internationally it�s actually the second best long I�ve competed." Matt does not plan to compete next season but says he hasn�t officially retired from skating. "I�m going to keep skating whether competitively or as a hobby. I�m going to Cornell Law next year." Nobunari Oda (Japan) who was in second after the short program was not able to maintain the momentum he had created in the qualifying round and the short program. He finished 5th in the free skate and 4th overall. This was Oda�s first World Championship appearance. He made a great impression and we can expect to see a lot more of him in the future.